Among the arctic Inuit people, “innunguaq” refers to an object in the likeness of a human. Stone innunguait (plural) have been erected since ancient times to welcome visitors, commemorate a cherished person or mark a special place*. This miniature is an interpretation of an innunguaq on Baffin Island that points across the waters of the Hudson Strait toward the northern coast of Quebec. Tiny plants often thrive in the shelter of innunguait during the summer, as reflected in this composition with plantings of centaurium scilloides. *Hallendy, N. (2000). 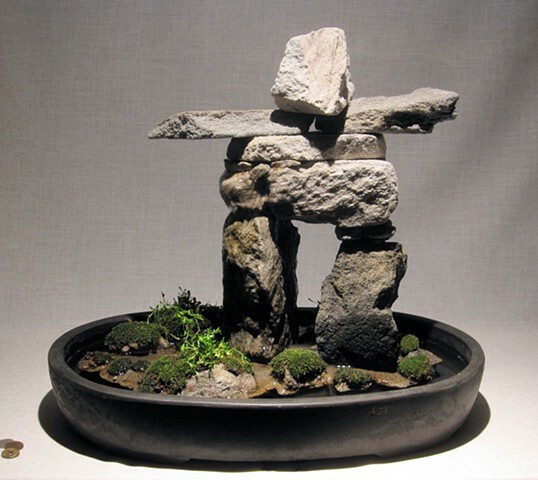 Inuksuit: Silent Messengers of the Arctic. Vancouver: Douglas & McIntyre Ltd.